You may remember an earlier post where I finally brought out my new sewing machine. The project I wanted to complete is an infinity scarf. Seems simple enough...even for a non-sewing person like me. I read several "how tos" on various internet sites. The beginning was pretty basic, but I just couldn't visualize the sewing of the ends together, but figured I just needed to dive in and get my feet wet. Before reading anything, I purchase 3 yards of a grey sweatshirty type material. It might be a stretchy jersey maybe. No clue. 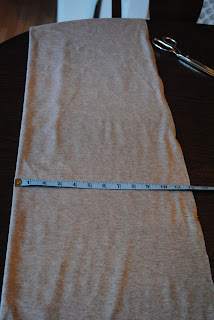 When I finally read the first "how to", it said to make it 2 yards long by 10 1/2 inches wide. Since I wanted to get four scarves out of the material I had, I opted to make mine 1 1/2 yards by 12 inches wide. I did make four scarves and finally got it perfected by the fourth one. If you know anything about sewing...stop reading now, cause I will just embarrass you and myself. But, if you are a sewing novice, this might help you attempt to make a scarf. 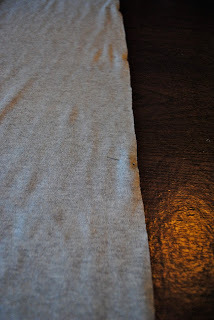 Fold you fabric, right side to right side and pin open end together. Sew the open ends together from end to end. I used the 5/8" seam marker on my machine. Most instructions said to use 1/4 inch or 1/2 inch seam, but I used 5/8" cause that's what I know. I then ironed flat the newly sewn seam. Again, this is what I was taught and it still works. Super hard to take a photo with my left hand! You will now have a long tube. Turn it right side out and then fold it back over itself until the ends meet. It's kind of like how you cuff your pants, just keep going until the ends line up. Turn the scarf right side out through the 2 inch opening. Shake is out straight and align the opening and pin. Sew the opening using a blind stitch. Make sure you use small stitches as that will make the closing more secure and help make it less visible. And...here's the finished product. Perfect for a cold winter day. One scarf is for me, the other three are for Krissy, Caity and one is for someone very special down Texas way. Love it! I've been thinking about learning how to crochet an infinity scarf, but not sure if I'm up for the task quite yet. Beautiful scarves though, and I like the stretchy fabric! ooh, that's really pretty! Really jazzes up a top I think. Thank you for breaking this down and making this simple! I am not a sewer either, but I think I can handle this with your simple directions!